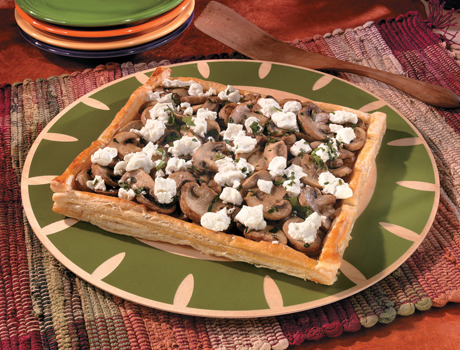 Creamy goat cheese, sautéed mushrooms, shallots and herbs fill a flaky puff pastry crust to make this elegant and savory tart. Heat the oven to 400°F. Line a baking sheet with parchment paper. Mix the egg yolk and water in a small bowl with a fork. Unfold the pastry sheet on the baking sheet. Cut 1/2-inch strips from each side of the pastry sheet. Brush the edges of the pastry sheet with the egg mixture. Place 1 strip on each edge of the pastry sheet. Prick the center of the pastry with a fork and brush with the egg mixture. Bake the pastry for 15 minutes or it's until golden brown. Let the pastry cool on a wire rack. Reduce the oven temperature to 350°F. Heat 1/4 cup olive oil in a 12-inch skillet over medium heat. Add the shallots and cook until they're softened. Add the mushrooms and cook for 5 minutes, stirring occasionally. Add the black pepper and cook until the mushrooms are tender and the liquid evaporates. Remove the skillet from the heat. Stir in half the thyme and parsley. 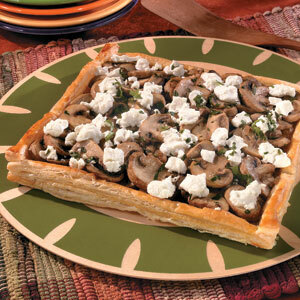 Spoon the mushroom mixture over the pastry and sprinkle with the goat cheese. Bake the pastry for 10 to 15 minutes or until the topping is hot. Drizzle the pastry with the remaining olive oil and sprinkle with the remaining parsley and thyme. Avoid pressing too hard when rolling out the ends and edges - you want to avoid pressing the edge layers together, as that will prevent the pastry from rising. To create a tart with an extra puffy crust: take a knife and score two lines around the edge, then prick the area inside this border with a fork.